SFE: How did you get started in the fiber arts? ED: I’ve been fascinated with yarn and fiber since I was a little kid. My first exposure to fiber arts was at a summer camp where I learned to weave and use natural dyes. My mother taught me how to sew and I used to make clothes for my dolls using yarn and fabric scraps from her stash and much anticipated trips to the local fabric store. SFE: What’s your favorite part of creating–carding, spinning, knitting? ED: I actually don’t know how to knit (I know, crazy!). I just learned to crochet last year and I find that easier to do and I’m working on getting better at it. I guess I would say I really love carding and spinning the most though. Dyeing is fun too because I get to play with color in a different way. 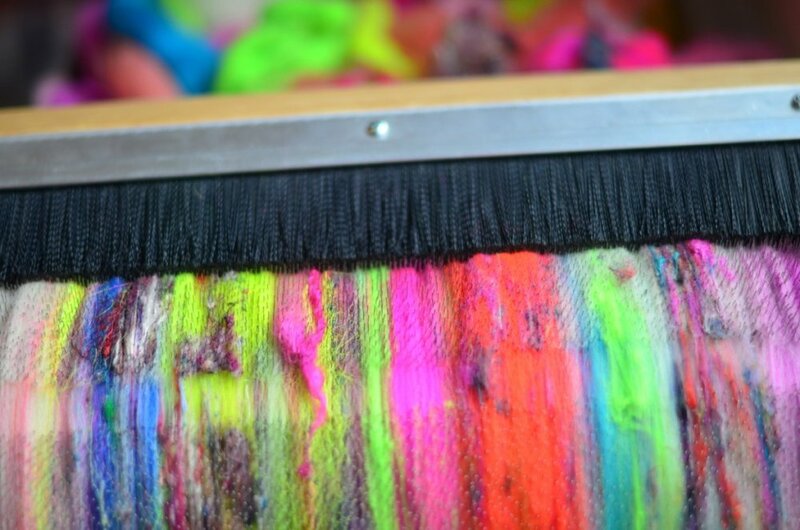 I have a lot of fun mixing dyes and coming up with some crazy color palettes. But there is something about just grabbing a handful of squishy wool and blending it together to make yarn that really appeals to me. Spinning has a rhythm that is very meditative and relaxing. You don’t have to pay as much attention as you would if you are knitting (or in my case crocheting or weaving). I could spin all day if I had the time. Elysa’s cheerful color combos on her Mad Batt’r. An art batt! Elysa’s handspun coiled art yarn Thanks so much to Elysa for sharing her lovely photos! We’d love to see what you’re making on your Strauch carders, too!